What a crazy week of NCAA football during the fourth week of full play. Many conferences and teams opened their in-conference schedules, while others finished up non-conference games prior to the start of complete conference play next week. In this week’s installment of “From Around the Mountain”, we will once again take a look at the good (UNLV), the bad, (Fresno State), and the downright ugly (Wyoming). Things looked up a bit for the Mountain West Conference this week, as for the first time this season, the conference completed the week with an overall winning record (6-4), even though some of the wins and losses were conference match-ups. The good this week, was a tough one for me to pick. I easily could’ve selected the cream of the crop in the Mountain West, by picking the Boise State/Virigina game, because Boise State simply put it on the Cavaliers from the first snap from scrimmage, getting a pick-six to open a 56-14 route and a road win. However, my heart remains in Vegas, and when the UNLV program, who has been so desperate to win over the past decade-plus, puts up 80 points, they win this week’s “good” label. After blowing a double-digit lead to open the season at Northern Illinois, and then getting stomped in their following two games, the Rebels were reeling as they hosted the Idaho State Bengals. The Rebels came out strong, and never looked back, putting up 35 in the first quarter, and tallying their highest final score since 1976. Rebels quarterback Blake Decker returned strong, tossing a pair of touchdowns and rushing for another. Tony Sanchez‘s offense put up more than 500 yards of rushing offense, with just over 100 in the air, while holding the Bengals to just 292 yards and one score. The sole highlight for Idaho State, was a 25-yard Michael Sanders touchdown pass in the second quarter to C.J. Hatchett. The bad this week, continues to be the Fresno State football program, but if you’re a fan of San Jose State, things are looking up. The Spartans hosted the Bulldogs Saturday, as Tyler Ervin set a school record with 300 yards, yes, I said 300 YARDS RUSHING and three scores for SJSU. Ervin also had 42 carries on the day, which set his career high as well. San Jose State ran away from the Bulldogs by a final of 49-23. Spartans quarterbacks Joe Gray was highly efficient, going 20-of-23, for 252 passing yards and he, like Ervin, accounted for three scores. San Jose State had more than 500 total yards, even their conference record to 1-1. Fresno State got as close as 28-23, after Jamire Jordan scampered for a rushing score, but the Spartans continued to dominate both through the air and on the ground, winning easily. 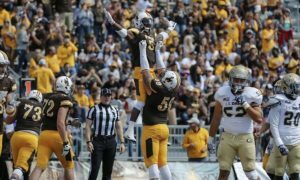 Finally, down in Laramie, things continue to go south for the Wyoming Cowboys, as they hosted the New Mexico Lobos. Give the Pokes some leeway though, as 45 freshman are on the roster, and a complete rebuild has to be the order of the day. A poor opening quarter for the Cowboys cost them on Saturday, as the Lobos opened the game with two first quarter scores en route to a 38-28 win. The Lobos are now 2-2 on the young season, while the Pokes drop to 0-4. The Cowboys showed flair through the air, putting up more than 360 yards passing, but were held to under 50 yards on the ground. The Lobos in contrast, ran for more than 300 yards, and wore down the Wyo defense. The big play killed the Cowboys in the game, allowing three scores of 40 or more yards. Lobos signal called Lamar Jordan was efficient, rushing and passing for more than 100 yards each, and was responsible for two touchdowns. The Lobos limited the most proficient rusher in the Mountain West, Brian Hill, who came into the game averaging just over 137 yards per contest, to only 49 yards on the ground on 18 carries. Other scores from around the Mountain West: Penn State 37, San Diego State 21; Nevada-Reno 24, Buffalo 21; Colorado State 33, Texas-San Antonio 31; and #22 Wisconsin 28, Hawaii 0. Join us again next week for the good, bad and ugly from around the Mountain West Conference in NCAA Football!